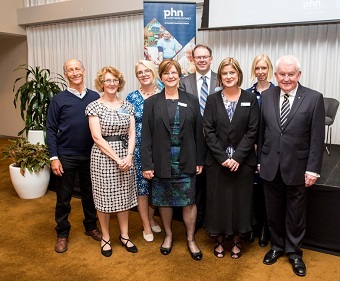 Thank you to our primary healthcare stakeholders, the SNPHN Board, SNPHN Members and Staff for attending Sydney North Health Network’s first Annual General Meeting and panel discussion on Thursday 10th November. Thank you to our Master of Ceremonies Dr John D’Arcy and Susan Moylan-Coombs for providing our Acknowledgement to Country. At the end of the evening’s formalities, the SNPHN Board met to elect the Chair and Deputy Chair of SNPHN for its second year of operation. Dr Magdalen Campbell was re-elected to the position of Chair and Dr Harry Nespolon was re-elected as Deputy Chair. Congratulations to both Dr Campbell and Dr Nespolon. Click here to download the PDF of the PowerPoint presentations from the panellists.